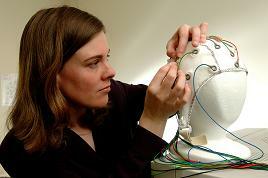 In the Cognition and Brain Lab we are interested in how the brain works while people perform language and memory tasks. In order to study this, we measure naturally occurring brain electrical activity (the EEG or electroencephalogram) and look at activity related to stimuli or responses in a cognitive task (Event Related Potentials or ERPs). In addition to ERP studies, the lab houses an eyetracker, which we can use to monitor where people are looking on the screen. To accompany these methods, we also collect behavioral data of various kinds (such as response times).